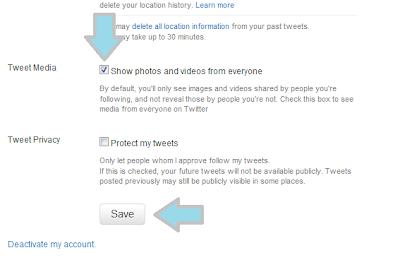 Home How to Tech Tip Twitter Tricks How to see photos and videos shared on Twitter like Facebook? How to see photos and videos shared on Twitter like Facebook? Do you want to see actual photos and videos shared by people you are following and not just boring looking short URLs. You can do it very easily. Just Login to your twitter account. Check the Tweet Media check box. Just Save your setting and you are all set. Enjoy the photos and videos like you enjoy them on Facebook. Also see : Useful Twitter Tricks and FaceBook Tips.